Gotta love peanut butter – Gracie does! Did you know that peanut butter’s good for more than PB&J sandwiches? Growing up, we used to hide pills in peanut butter to get my dog to swallow them; my parents heard this trick somewhere. Since then, we’ve discovered that it works well for the St. Anne’s yellow lab, Gracie, as well. 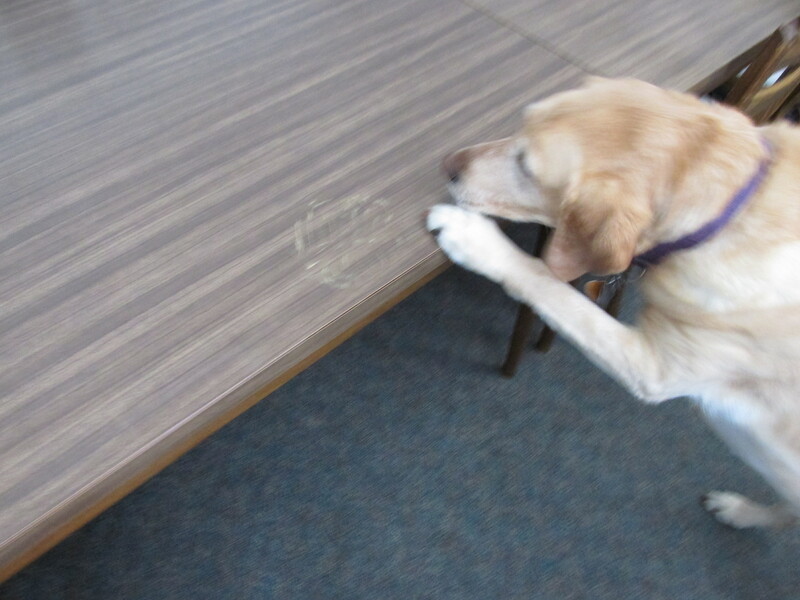 In fact, yesterday, I was using peanut butter to clean a stubborn spot of the table, and Gracie followed her nose. Wood scratch repair (on wooden furniture, doorjambs, bannisters, etc.). Put peanut butter on the scratch and let it soak in for 30-60 min. Rub it away with a cloth and the scratch will be almost impossible to see! CD/DVD scratch repair (for a CD or DVD that keeps skipping, or won’t play, rub a little smooth peanut butter onto the scratch and wipe it away with a soft, dry cloth.